When you hear about Stephen Hawking, you hear about his mind. What you hear about far less is his life, and that's a shame. Within it, there is a beautiful love story. Rightly so, The Theory of Everything brings the personal tale of one of the brightest living humans to light. *Fair warning of spoilers ahead, but nothing you can't already read on the internet. 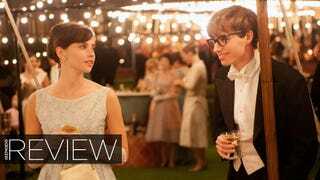 Directed by James Marsh, The Theory of Everything is a biopic, adapted from the autobiography Traveling to Infinity by Jane Hawking (played by Felicity Jones), Stephen Hawking's (played by Eddie Redmayne) first wife. The movie almost didn't make it to the big screen. Anthony McCarten, who wrote the adapted screenplay, first read the book in 2004. He traveled to Jane Hawking's house 10 years ago, knocked on the door and asked her if she'd give him the rights to the film. It took about eight years of trust-building before she agreed. You may not know the story of Stephen Hawking's personal life, and that's probably by design. The scientist is a private man. In many ways, this is the first time his story has been opened up to such a wide mainstream audience. It's a story you've never heard before. "[Hawking] is a cosmologist and he wanted people to become fascinated by the universe, not his personal life," McCarten told me over the phone. "He is probably the most recognized voice now for cosmological ideas. However, it left the public with the perception that he's American, because of his synthesized voice from a computer. "Almost nobody knew that he's actually English, that he was not always in a wheelchair. That only began to happen in his early 20s. Almost no one knew he had been married twice, and fathered and raised three children. So there was a lot of news to break with this story." McCarten is exactly right. This was a totally new story to me. I didn't know about his wife and the three kids they had together. I never even thought about his family, and I never considered his life before he needed a wheelchair. Perhaps that's ignorant, but it's the honest truth. But The Theory of Everything puts Stephen Hawking, the man, the person with rich feelings and emotions in the forefront. The story is quite beautiful. But it's not told directly from the famous cosmologist's perspective. No, this is really Jane's story. It's a look deep into her life's challenge of loving and standing by this man with almost no help. And as his career went up, his body declined, and he relied, increasingly, on his loyal wife. "I personally love tangential approaches to history, not the obvious approach. You approach a famous icon through another door, and Jane's story just shines so much light on the characters here," McCarten said. The Theory of Everything is a love story filled with the highest highs that often come alongside the lowest of lows. It starts in Cambridge, England in 1963, as a young and fit Hawking is beginning Ph.D. work at Cambridge. He's struggling to figure out his focus. And what happens? He meets a girl. A beautiful, smart, challenging girl. And they fall for one another. But once they're really in it, Hawking receives a death sentence: he has a motor neuron disease (a condition related to ALS), and only two years left to live. So live he did, working on scientific breakthroughs and building a family. It is a deeply gripping film. The best are the true stories, and even are the ones we don't think of immediately. This is all of the above. The Theory of Everything is an uplifting tale too. It's about overcoming adversity and physical infirmity. In spite of the fact that Jane and Stephen are no longer married (both have re-married, but they remain friends), it is beautiful. A few things really struck me: one, is the physicality of the role Eddie Redmayne played. When the story starts, Hawking is living perfectly self-sufficiently, walking and taking care of himself, perhaps a bit gawky, but otherwise, as if nothing were wrong. But by the end, he's completely bound to a wheelchair, as the Hawking we know today. But that progresses throughout the film, and Redmayne perfectly encapsulates the break down Hawking endured. And he fully conveys the challenge—emotionally and physically—that undoubtedly was and is. Redmayne spent four months studying Hawking's life, a process that required so much research, it was like writing a doctoral dissertation. He watched every documentary and YouTube video he could find on the man… He contacted a physics teacher at Imperial College London who proved to be a good translator. He also worked with a choreographer, Alexandra Reynolds (she made the zombies twitch in "World War Z"). "We put what we knew into picking up a pen, drinking, walking, existing," says Reynolds, who labored with Redmayne for four hours a day, and filmed his movements on an iPad for them to study… very two weeks, Redmayne would visit a neurology clinic in London, where he'd interview patients. He met with more than 30, and even went to some of their homes. Since the film wouldn't be shot chronologically, he had to understand how the disease affected Hawking at different stages of his life, and had a doctor consult with him on vintage photographs to see how Hawking's body deteriorated. The prep work shows. It's one of those films like Ray or Walk the Line, where the actor disappears into the character, and you're not looking at an actor playing another person—it's actually that person. For all intents and purposes, Redmayne truly becomes Dr. Hawking. The buzz is, he could take the Oscar for this role. I don't think that's a wrong assessment. The other thing that stayed with me is Jane's strength, on both a physical and an emotional level. She singlehandedly cared for her husband as his body failed. She had very little help. She raised three kids and cared for her husband as his body failed. She had the emotional support, but she was the only one waking up in the middle of the night to change a diaper or sooth a fussy baby. She shouldered a lot of the burden of parenting without help. That's a feat in and of itself. It took a toll on her too. The movie begins in happy years, has its ups and downs and plenty of struggle, but in the end it closes with happiness. Though Stephen and his wife have divorced, there's still a lot of love between them, and that lasts beyond the confines of a film. The Theory of Everything opens in theaters Friday, November 7. You should go see it.